A video course on writing effective email marketing campaigns to promote affiliate offers in the internet marketing niche. I felt the advertising for this product was quite deceptive, and used typical guru internet marketing tactics to try to squeeze money out of buyers. However, the quality of content was very good, interesting, and useful. 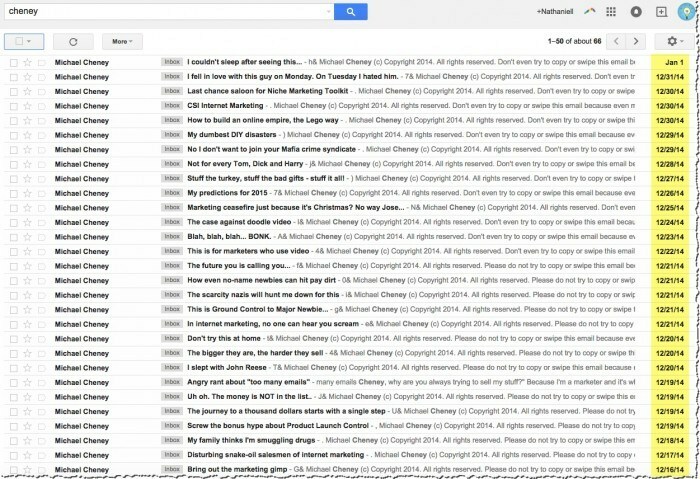 I’ve never been a fan of Cheney because I’ve read some of his emails and they were quite annoying in my opinion. They were written in typical guru fashion, with obviously rapid-fire promotions thinly disguised as humorous stories. The lead up to the product pretty much fit into my exact impression of this guy. After purchasing the product I was immediately given a chance to make money “faster” and “easier”. Wow! Who wouldn’t want to do that! But for $197, no thanks. Then, as if he had to fulfill every stereotype possible, he then offered 7 “done for you” money machines. If only making money was as easy as having someone do it for you. Unfortunately, I can’t say much, because this type of advertising works, which is why so many people do it. But am I alone in thinking that it’s annoying as hell? 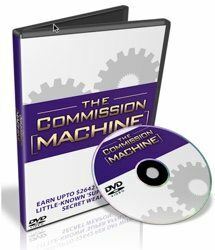 What is The Commissions Machine? 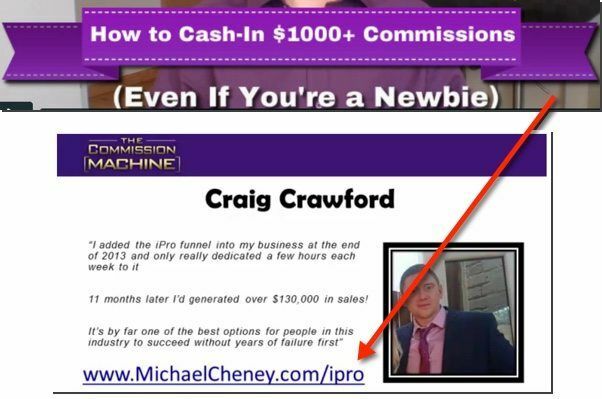 It’s unfortunate that this wasn’t more clear from the sales page, but the premise behind The Commission Machine is that Cheney is teaching us how to deliver an effective email marketing campaign to promote affiliate offers in the internet marketing niche. How is this a “commission machine”? I have no idea. It’s just another example of a stupid product name meant to resonate with our lizard brain for fast, easy money. Here’s the breakdown of what’s inside the members area. Despite all my negativity above, the videos inside the members are being actually very good. Cheney is a great presenter. He’s very animated, organized the video swell, and the general production value was higher than I’m used to seeing in similar products. I was not a fan of this guy going into the product, but honestly, he kind of grew on me while watching the training. He’s got plenty of corny jokes, and speaks confidently, showing that he knows what he’s talking about. Although I disagree with some of his marketing tactics, they are obviously working for him, and I can understand that for some folks, that’s just how this industry works. Two more important points to mention about the training. 1. He uses examples from personal campaigns to SHOW us how to implement his advice. 2. For each video there is face-to-face camera time, a powerpoint presentation, AND over-the-shoulder training. For $37? Yeah, I’d say that The Commission Machine is worth the money. 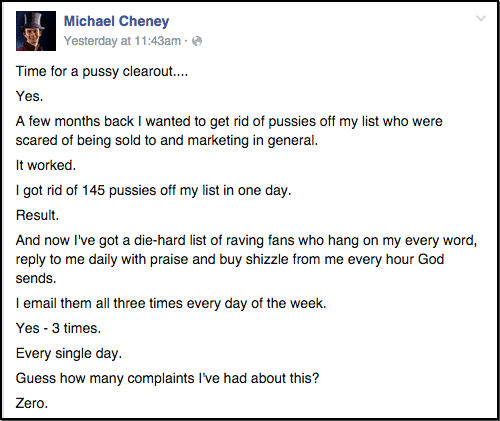 I’d stay away from Cheney’s list though, because it’s clear you’re going to get force-fed a new offer every day. 1-3 emails every day until you unsubscribe! I know that this stuff is pretty standard for the internet marketing industry, but that doesn’t mean I have to like it. I was unhappy to find out that Cheney asks me to spend another $200 on a “commission machine” that I have no idea what it is yet! Then, after reaching the members area, Step 1 is a link to a 45 minute webinar which is actually another upsell for a high ticket item called iPro, which seems to be making the rounds lately. Come on man. Don’t you think it’s a little shady to tell me that Step 1 of your course is to buy someone else’s product? That’s pure marketing garbage. Actually we don’t get to the core training of The Commission Machine until Step 3! Sure, I think the price for this product was appropriate, but it was still quite short. About 3 hours of video can be consumed in a day, and the concepts he talked about were not that hard to grasp. Along with this, is that a lot of this product was just “advice”, instead of exact steps you need to take to actually take action and implement the training. I guess he can’t spoon-feed you everything, but I think that’s what a lot of people are looking for. I was surprised that there was nothing included about traffic generation and list building at all. The course was pretty much just how to find a product on JVZoo, then how to write effective emails to promote those products to your list. The portion he taught was really good, but there were a lot of missing pieces to the puzzle. I felt like was just a cog in the machine, and not the whole machine itself. How do I set up a squeeze page or opt-in form? How do I use an autoresponder? Without these answers, you’re going to be stuck with module 7 for delivering your messages to an audience. Even then, it’s quite a short video with a few ‘tricks’ that may or may not work. Update: I was just browsing some products to review and was surprised to see that people have very different taste in products than I do! For example, I liked Cheney’s product here, but it has over a 12% refund rate, which is very high in comparison to similar products! That’s in comparison to The Super List Method 2.0, which I hated, but only has a 5% refund rate! I don’t know what this means, but just updating the post so you can make your own decision. Newsflash – people do complain, but not to your face because they know that they will be sent rude emails in return. I’ve seen several instances of people complaining on Facebook and to me personally via email about annoying marketing tactics emailing people 3x per day. People just hit the unsubscribe button and write you off as another ‘guru’. I cannot really understand how sending offers every single day counts as value. I honestly don’t think this tactic works as well as he says it does, and I personally believe that this is a way to get people to react, and buy more stuff. People say to themselves, “Hey, I’m not a *****! I’m a real man! Please send me more offers so I can prove that I’m tough and can take it. In my opinion, if someone is purchasing more than a few internet marketing products over the course of a year, they aren’t paying attention to what they learn and need to re-evaluate their business strategy. Overall, it was a good product and if you do email marketing I think you will enjoy the training. If you do not currently have an online business, I think there isn’t sufficient information or instruction to get you started.